ADD TO CART FOR LOWER PRICING! New Longer Radio Range for Remote and Automatic Features up-to 500-foot. Spectra Precision announces the launch of the new Spectra Precision GL622N Dual-Grade Laser. This laser replaces the GL622 and updates include a new long range radio and HL760 digital readout receiver. These lasers offer automatic self-leveling in grade, horizontal and vertical planes. Both feature grade capability of ± 25% and can be used in a wide variety of grading, excavating and alignment applications by general and specialty contractors. The GL622N is a dual slope grade laser. 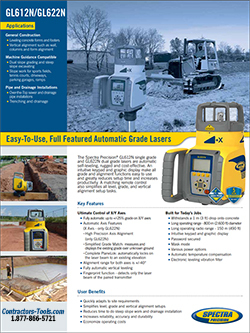 This rugged, automatic self-leveling laser has a grade capability of ± 25% and can be used in a wide variety of grading, excavating and alignment applications by general and specialty contractors. An intuitive keypad and graphic display mae all grade and alignment functions easy to use and greatly reduces setup time and increases productivity. The GL622N includes the RC602N full-function radio remote control. Both the remote and lasers have a large, intuitive graphic displays and keypads that make setups easier and faster than ever. The displays are also backlit for ease of viewing. With the remote, contractors can do everything that they can do at the laser keypad, up to 500 feet away. The ability to make grade changes and start automatic alignments remotely can significantly reduce setup time and speed operations. Grade Match: Wireless communication between the HL760 Digital Receiver and the transmitter provide automatic Grade Matching which allows measurement of unknown grade values between two points. Plane-Lok: For applications that require maximum stability and accuracy, PlaneLok is available in both the horizontal and vertical planes. PlaneLok automatically locks the beam on the receiver and keeps it on grade, reducing typical environmental factors that may induce an error. In addition, the HL760 Digital Receiver can communicate with another HL760 for long-range wireless remote display and monitoring. The GL622N Grade Lasers self-plumb in the vertical position to allow an even wider range of applications such as such as anchor bolt installation, form, tilt up, and curtain wall plumbing. 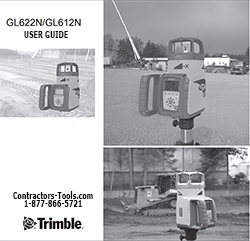 With its rugged design, the GL622N lasers can survive a drop of up to 3-feet on concrete. The lasers also feature IP67 moisture and dust sealing to handle the tough construction environments. -25% to +25% (not simultaneously on both axis). 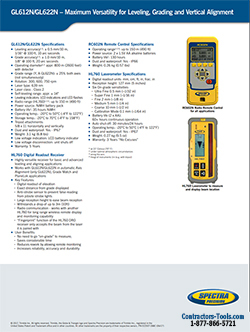 Radio communication between the laser and HL750 Laserometer allow advanced features and remote display capabilities. Grade Match displays the existing grade over unknown ground and eliminates time consuming and error prone calculations.